Globi Coelestis in Tabulas Planas Redacti Pars IV. Published by J. B. Homann, this is a very nice example of DoppelmayerÂ's map of the constellations. Focuses on the Zodiac constellations of Leo and Virgo, though Bootes, Ursa Major, Chara, Hydra, Libra, and others and also visible. Each constellation is stunningly illustrated in 18th century German baroque style. Text toe the left and right of the map proper offers coordinates for the individual stars in each constellations which are identified via an alpha-numeric code. Issued as plate no. 20 in the 1742 edition of DoppelmayerÂ's Atlas Coelestis. Johann Gabriel Doppelmayr (September 27, 1677 - December 1, 1750) was a German mathematician and astronomer active in the first half of the 18th century. Doppelmayr was born in Nuremberg to a merchant family. He attended the Aegidien-Gymnasium and the University of Altdorf where he studied mathematics, physics, and law. His graduating dissertation, a study of the Sun, suggests an early interest in Astronomy. Following his studies in Altdorf, Doppelmayr traveled extensively in Europe and is known to have spent time at the University of Halle, as well as in Utrecht, Leiden, Oxford, and London. He returned to Nuremburg in 1704 to take up a mathematics professorship at his alma mater, the Aegidien-Gymnasium. It may have been here that he developed a relationship with the prominent Nuremburg map publisher J. B. Homann, with whom he prepared a number of important astronomical maps and atlases. 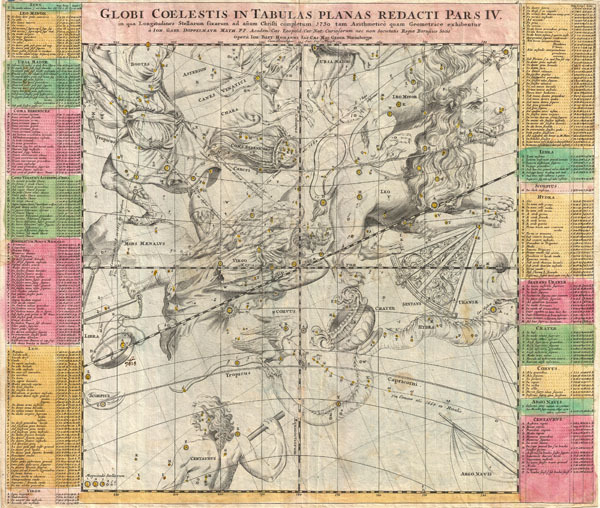 The collaboration of over 20 years eventually led to the publication of the Atlas Coelestis in 1742. This astounding work was the most elaborate and detailed astronomical atlas yet published and is today much admired for its rich beautifully engraved plates. Doppelmayr died on 1 December 1750 in Nuremberg, and many later sources claim that his death was caused by the fatal effects of a powerful electrical shock which he had received shortly before while experimenting with a battery of electric capacitors. Other sources, however, suggest that Doppelmayr's electrical experiments were performed several years earlier and were not the cause of his death. Today the Lunar crater Doppelmayr and a minor planetoid are named in his honor. Doppelmayr, J. G., Atlas Coelestis, (Homann: Nuremburg) 1742. Good condition. In addition to the original centerfold this map also exhibits an intersecting horizontal fold. Verso suggests that it was previously mounted for framing. Else clean.